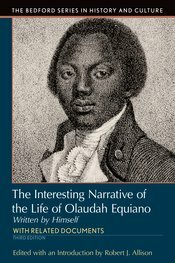 This revised edition of The Interesting Narrative of the Life of Olaudah Equiano, Written by Himself, with Related Documents continues to offer a vivid account of the eighteenth-century Western world through the experiences of one individual. Robert J. Allison's introduction, which places Equiano's narrative in the context of the Atlantic slave trade, has been revised and updated to reflect the latest scholarship surrounding this topic. Additions to the Related Documents include a contemporary review of The Narrative, as well as excerpts from the Declaration of Independence and the debate over the Slave Trade at the Constitutional Convention, which serve to anchor Equiano’s story within the U.S. history narrative. Helpful footnotes provide guidance throughout the eighteenth-century text, and a chronology and updated Questions for Consideration and Selected Bibliography aid students in their study of this thought-provoking narrative.